After 14 years of experience reviewing tax returns, I have seen five clients in a row miss the general sales tax deduction on line 5b of their Schedule A for itemized deductions. After seeing five intelligent, successful people with college degrees miss this important deduction and pay too much in federal income taxes, I decided to investigate. Below the blue section is a section called All Tax Breaks. Under that section is a section called Estimates and Other Taxes Paid next to the green calculator. Inside of this section people who live in the seven states without income taxes need to click Sales Tax, Easy Guide and enter their sales tax rate. The software will then calculate the allowed sales tax deduction for you if you didn’t keep receipts (who really has time for that). If you made a large purchase such as a car or boat, you are allowed to add the sales tax from the large purchase to the calculated sales tax deduction. My guess as to why my small sample size of five clients missed this deduction is that the software doesn’t have a pop up screen to tell people in the seven states without income taxes they should be taking this deduction. The majority of my clients live in Texas, one of the seven states with no state income tax. The other states with no state income tax are Alaska, Florida, Nevada, South Dakota, Washington and Wyoming. To TurboTax’s credit, you can dig into the deductions and add this to your Schedule A. The issue is that you need to know to look for the income tax deduction in the first place. My client amended her tax return and received a $213 refund on an adjusted gross income of $61,000 for 2016. 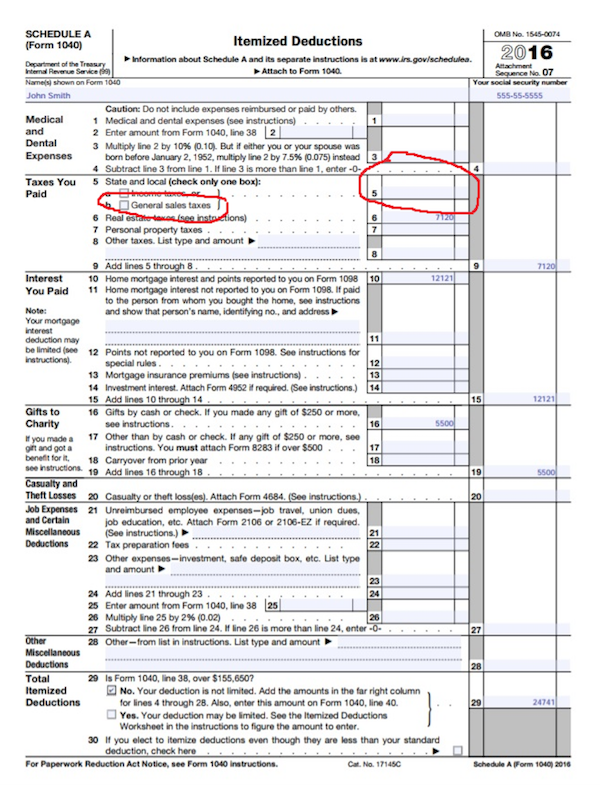 If you live in a state without income taxes and are able to itemize your taxes, please take a minute right now to look at line 5 on your Schedule A (usually the third page of your tax return). If it is blank, you are welcome. I just saved you some money. If you missed this, you generally have three years from the date you filed your original return to file an amended return. If you filed your 2014 tax return on or before April 15, 2015, you have until April 15, 2018 to amend it. You will also want to make sure to follow my instructions above to make sure you do your 2017 tax return correctly. There are helpful directions that will explain how to use TurboTax to create the 1040x forms needed to amend your return. We found that amending the 2016 return wasn’t that bad. In order to amend the 2015 and 2014 returns, you have to download the previous year’s versions of the software. Disclosure: Domestique Capital, LLC (“Domestique Capital”) is a registered investment adviser offering advisory services in the State of Texas and in other jurisdictions where exempted. Registration does not imply a certain level of skill or training. Always consult your tax adviser before acting on something you read on the internet.